Facebook now is faced with the dilemma of having more businesses than buyers. The fact that the businesses initially flourished immensely in the beginning, now, everyone wants to start their business and earn money from the platform rather than spending on it. Due to a stagnant pool of consumers, the percentage of followers for such businesses went down 52 percent in early half of 2016. A number of admins take the fact that some pages boost themselves by paying for ads as a conspiracy. This adds up to the inefficient communication from Facebook itself, urging people to promote their pages via advertisements, that they can't completely rely on the news feed for the access. Now, Facebook is trying to make these pages anew. They will no longer be a mere walkthrough for the people to be guided towards the actual site that offers a particular service. About 80 million pages were redesigned, belonging to the small business, having a consumer load of about 1.6 billion people. The new features will include the utility related to that particular business. For example, features like “get an appointment” or the facility to make the call for salons, for restaurants, menus, and reservations, etc. Not only this, to make the reviews short and worthy, there is a limit of 300 words imposed for the reviewers. One thing that’s quite unsettling is the suggestions of related pages when you visit a particular page. This, as assumed by the people running those pages, could lead to the division of an already thin consumer population. “Inside the Facebook app, there’s no easy way to discover new businesses. 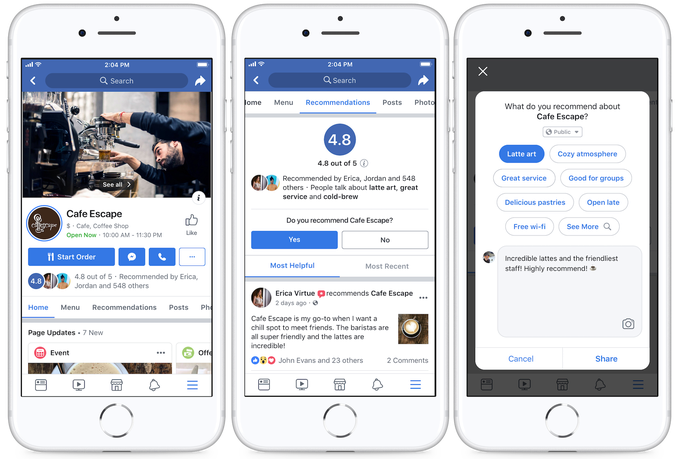 The focus here is to make it easy to discover new businesses which we think any business will be excited about.” says Alex Himel, Facebook's VP of local. Moreover, it's also providing the option to put up stories for the businesses as well as the job application tab, so that the recruitment for these businesses could be made easier. Having released it in the app back in 2017, Facebook has now released its bookmark option for the desktop site as well. About 700 million people are consuming the service of Facebook Events every month, making it a strong connection between businesses and customers. Facebook is doing its best to provide support for the businesses run under it, let us see if it gets an equally fruitful end.